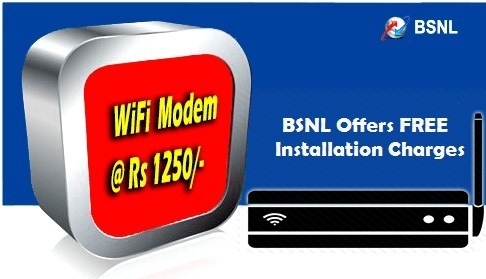 Bharat Sanchar Nigam Limited (BSNL) announced the revision in sale price of ADSL WiFi Broadband modem to ₹1250/- for its customers in all the circles. As per the latest information, customers may purchase new WiFi broadband modem from BSNL @ just ₹1250/- instead of ₹1500/-. The revised sale price is inclusive of all taxes. As we reported in November 2015, BSNL regularized the promotional sale price of ADSL WiFi Broadband Modem at ₹1500. It has been decided to revise sale price of ADSL WiFi modem from exiting Rs. 1500/- to Rs.1250/-(including all taxes) for new customers in all the telecom circles. Unlimited Combo Broadband @ just ₹249 per month (no additional charge for landline) with 8 Mbps download speed. Waival of installation charges of ₹850/- for new landline + broadband connection & ₹250/- for new broadband connection on existing landline. 24 Hours Unlimited free calling to any network in India for the following 6 Broadband Plans : BBG Combo ULD 1199, BBG Combo ULD 1495, BBG Combo ULD 1599, BBG Speed Combo ULD 2295, BBG Speed Combo ULD 1745 VDSL and BBG Super Speed Combo 2845 VDSL.